You may encounter this error while you are running DISM tool. The error description of Error 0x800f0906 – the source files could not be downloaded, tells us that the Windows Image is corrupted. But unlike the other error messages in the previous posting about Corrupted Windows Image, the DISM tool may not completely repair the Windows Image. You only get the following descriptions on your screen about the problem. So it may somehow make you feel lost for any real resolution to it. It is not an easy task to resolve this problem but with a few commands, you should be able to fix the problem. Run the following commands one after another. Exit Command Prompt and reboot your computer. 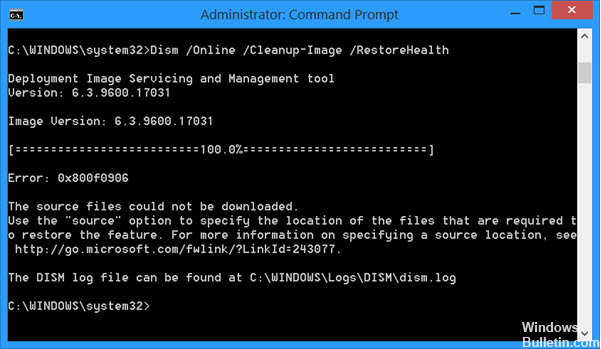 Run DISM /Online /Cleanup-Image /RestoreHealth again. You shouldn’t receive the error code anymore. If any other error comes up, comment it and we will help you find the resolution.